After reaching a plea agreement to avoid trial on charges related to the alleged abuse of his four-year-old son, Adrian Peterson had hoped to return to the Minnesota Vikings this week. But the NFL has reportedly shut that idea down, saying it needs more time to make its decision. According to a report from Fox Sports, Peterson's camp and the NFLPA had kept the NFL apprised of the coming plea deal, and requested that Peterson be returned to the Vikings' active roster immediately upon making it official. No dice. Even as Roger Goodell testifies at Ray Rice's appeal hearing, the NFL has reportedly refused to tip its hand on its plans for Peterson, or even to inform Peterson what he would have to do next to expedite reinstatement. "We will review the matter, including the court record, and then make a determination on his status," McCarthy said. "We cannot provide a timetable." Peterson remains on the commissioner's exempt list, which allows him to be paid but bars him from team facilities. The whole process is little-used and less-understood, but it basically gives the league office unilateral control over when a player may become eligible again. No hearing is required—though there might be one anyway—just Goodell deciding when it's politically prudent to allow Peterson back onto a football field. One league source told ESPN that "there's no hurry but no delay either." Considering his legal situation I'd expect Peterson to be reinstated sooner rather than later. On Tuesday, he pleaded no contest to a misdemeanor charge reckless assault. If he completes the terms of the agreement—a $4,000 fine, 80 hours of community service, parenting classes, and two years of probation—the case will be wiped from his record. 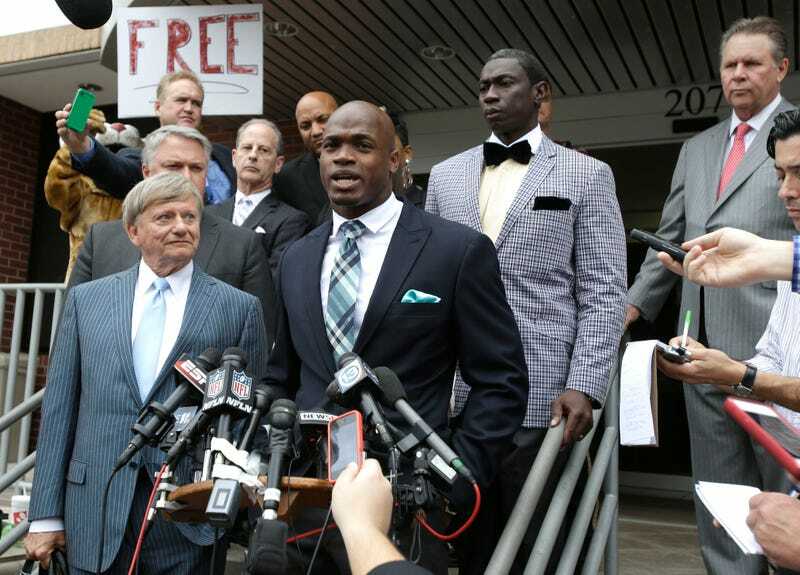 "I want to say I truly regret this incident," Peterson said after reaching the plea deal. "I stand here and I take full responsibility for my actions. I love my son more than any one of you can even imagine."